Real People Press continues to be a leader in the field of NLP publishing (since 1979) with our new line of digital downloads. Now you don't have to wait or pay for shipping to learn these precise and effective methods of personal change and communication. What does an exploding pink mailbox have to do with remembering to check the mail? Learn the skill of "future-pacing" with precision and you'll become a more effective coach, parent, or just develop a better memory with our exclusive audio program, "Future Pacing: Programming yourself now to remember later." Also check out our other classic NLP audio programs like Advanced Language Patterns, Successful Parenting, The Aligned Self, The Decision Destroyer, and The Forgiveness Pattern. Most of our DVDs are now available for download as high-quality video files. This includes all of Steve Andreas' Client Session Videos as well as the Eye Movement Integration video, The Last Straw Threshold Pattern, Andy Austin's Weight Loss using Metaphors of Movement client session, and more! To download and watch the video of your choice right now, go to "NLP DVDs & Video.". Click on the DVD you want. Scroll down below the product description, and you'll see "Three Options for Purchase." You can choose between downloading this video right now, or having a standard DVD shipped to you. We also now have all of our classic NLP videos available for download here. 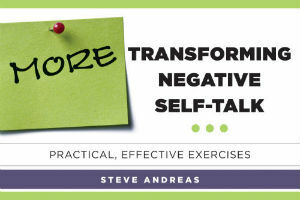 Steve Andreas has written a ground-breaking two-volume set of books on transforming negative self-talk. Help with Negative Self Talk, Volume 1 is no longer available from Real People Press since it is being published by Norton, under a new title. 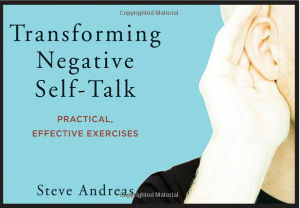 Here's the link to order from Amazon.com (also available on Amazon Kindle): Transforming Negative Self-Talk. Help with Negative Self Talk, Volume 2 is now titled More Transforming Negative Self-Talk and will be available from Norton in July 2014.